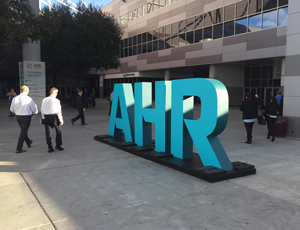 I've been to my fair share of AHR Expos over the years, but I can't remember a year where the crowd was as overwhelming as it was today. The show officially started at 10 a.m., and by 11 a.m. the aisles were packed to the gills and the registration line still ran the length of the Las Vegas Convention Center. As I made my way from booth to booth, navigating my way through the sea of people, I overheard many conversations about this innovation or that new product. Every attendee I spoke with had seen something that excited them. The first day of the AHR Expo always begins the same way for me, with the annual Taco press event prior to the show opening. High-efficiency Comfort and Taco Family Support is the theme this year, and it sums up perfectly what this company is all about. In addition to Taco, I visited with — and saw some exciting trends and innovations from — the representatives of Lux Products, Trane, Vertiv, Emerson, Johnson Controls, Daikin, Shurtape, Friedrich, Rheem, Parker Sporlan, Waterfurnace and many more. For a rundown of what I saw at these booths, check out our Twitter feed — and be sure to follow along tomorrow as I continue to explore the show for more innovations. Stop and See Us at AHR 2017!